Win a Le Creuset 2-Quart cherry batter bowl ! Do you not need this fabulous bowl in your kitchen??? For a chance to win: Show me your Thanksgiving favorites! Whether it’s your stuffing/dressing, a dessert, a side dish, or anything else, show me what your family has to have on your Thanksgiving table. Submit your Thanksgiving recipe then leave a comment on this post telling me the name of the recipe you submitted! You can enter multiple times for this contest by submitting more than one recipe. Leave one comment per submitted recipe for multiple chances to win. This giveaway will remain open to entry from now (right now!) until noon Eastern (U.S.) on Thanksgiving Day (November 25). One winner will be drawn by random comment number to receive the batter bowl. Eligible entry cut-off is 12 noon Eastern (U.S.) time Thursday (November 25). This post will be updated with the winner by 4 p.m. Eastern (U.S.) time Thursday (November 25). Return to this post to claim your prize. Note: You must be registered to post a comment and submit recipes. Sign up (it’s free!) and join us! 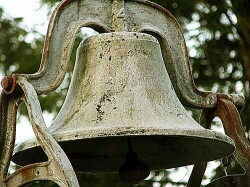 Interested in contributing a guest post to the Farm Bell blog? Read information here for Farm Bell blog submissions. THIS CONTEST IS CLOSED. The winning comment number is #14, tea4too0. Email me at CITRgiveaways(at)yahoo.com with your full name and address for shipping! Just added a new favorite here, a Sweet Potato Pie with Marshmallow Meringue. Could anything say Thanksgiving more than Sweet Potato Pie?? Well, other than turkey, of course! I submitted the Brown Sugar Pecan Cupcakes with Caramel Frosting recipe. I so need this bowl because my mixing bowl is a plastic 12 year old Act II popcorn bowl. Hope I win. I submitted the “Best and Easy Corn Casserole” recipe which is a family favorite and goes to all potlucks as well! I hope someone tries it. I submitted Ham Roll-Ups….super easy and delicious appetizer that is on the menu at every big family get-together. I REALLY want this bowl! Rotel Cheese Dip added — super easy hot cheese dip that you can make as spicy as you’d like. I submitted our family’s bread stuffing. I would just eat this for Thanksgiving if I could! I love that batter bowl! Cucumber & Rye appetizer added. I REALLY want this bowl! LOL! Just submitted my favorite Chocolate Chess Pie recipe that everyone requests for family get gatherings. Now I am off to bake 8 of these for the bake sale at school this week. I think my nephew could eat all 8 of those pies at one time, he loves them that much!!! Just signed up, and submitted a fall standby that is perfect for Thanksgiving…Applesauce Cake. Delicious, easy, perfect for desert as well as breakfast the next morning! And I would dearly love this batter bowl, it made me gasp with its beauty! That’s much prettier than my Pyrex batter bowl & would look great on our Thanksgiving table filled with soup. I’m sharing a recipe for oranges stuffed with sweet potatoes which is always a hit! I added an Egg Nog recipe; it’s a tradition in our family to have Egg Nog during the Thanksgiving and Christmas holiday. I just submitted a recipe for my family’s favorite cranberry salad with mandarin oranges. Its been a hit for my entire life. And its so easy! My kitchen is all in reds, so that bowl would be so beautiful at my house, or in my mother’s newly remodeled country kitchen accented with red! I have submitted my favorite dish, Yum Yum Salad. I have submitted a family favorite Thanksgiving dish. I submitted my Bread Machine Roll recipe. I have people mad at me if I don’t make these at Thanksgiving as well as Christmas. I added Aunt Ramona’s Pecan Pie recipe. This would match the couple of precious Le Creuset pieces that I have so beautifully. Plus I have an affliction for batter bowls. I luv them. I added My Momma’s Cherry Pie! I submitted Ranch Jiffy Corn Casserole. My husband refuses to eat a Thanksgiving dinner without it! Just submitted Southern Pineapple Au Gratin to the recipes! It sounds strange, but it is just amazing with turkey or ham for the holidays! I’d love to win the batter bowl, it is lovely! I submitted orange dreamsicle salad. I submitted roasted vegetables, our family’s favorite! I entered Molded Jello Salad. I’d really like to win that red batter bowl. It really would liven up my kitchen. I just submitted Bourban Sweet Potatoes. As I said there, I make sweet potatoes every year, but have never actually made this recipe. I just found this recipe, but it will definately be the sweet potatoe dish on my table this Thanksgiving. It sounds sssoooooo good, I can’t wait to make it and have a big old heapin’ helpin’. I would really, really, really love to win this bowl. Just gorgous! I submitted Freezer Crescent Rolls. They are my family’s favorite, and it isn’t a holiday without them. Anytime I go to a potluck dinner, the organizer will say to me, “And would you mind terribly bringing your rolls?” They are easy to make and I have never given out the recipe and heard of a failure–they are pretty much foolproof. You can bake them without freezing them, but it is so convenient to have some in the freezer for fuss-free holidays or Sunday dinners. I entered our family favorite – Sinful Potatoes. They are too good to have very often, but when we do make them, they don’t last very long at all! I hope I can win that batter bowl!! I am not a fan of stuffing, but I posted the recipe I’ve created to appease stuffing lovers, while still enjoying it myself. I just submitted my mother’s raw cranberry salad recipe to the recipe forum. She made it for Thanksgiving and Christmas; it has a festive appearance because of the red cranberries and the orange, and it is so easy. I love red and that batter bowl would make me happy!! I’m sharing my Easy Cranberries recipe. So good – so easy. Now send me that gorgeous Batter Bowl! I submitted a recipe for Crocked Pumpkin. YUM! Pink Junk! It’s a family tradition! I just added Rollickes. They look complicated, but are not….heavenly rolls made with mashed potatoes. I submitted Generations Past Pumpkin Pie. This recipe goes back so many generations, we’ve lost track! I have updated the recipe to use canned pumpkin and premade pie crust, but it is still the best pumpkin pie recipe ever! I get requests for it every year at Thanksgiving and Christmas. Psst…I’ve never shared the recipe with anyone until now! Enjoy! I submitted a fabulous dessert that can also be used for breakfast or brunch. i guess I should tell you that the name is Easy Cream Cheese Crescent Roll Dessert. It’s a big hit at work anytime. I submitted Pumpkin Pie from Homemade Puree. It is the one item on my Thanksgiving Menu that never changes. From the 1950 Better Homes and Gardens cookbook, it is divine. Nothing fancy, but the purity and simplicity of it is what makes it delicious! I submitted my Sopapilla Cheesecake recipe, that my family requires me to bring to every Thanksgiving. I submitted my dad’s Apple Crisp recipe that I begged him forever to give me the recipe for!! I submitted my grandma’s Potato Casserole recipe that she made every year for Thanksgiving. That red bowl would perfectly match my kitchen. I think I need it!! I submitted a sweet potato casserole recipe that I just love–topped with a brown sugar and pecan topping. Yum. Every year I volunteer to help prepare the food for the local homeless shelter’s Thanksgiving meal and this is the dish I take. It’s always a huge hit with everyone. I submitted a recipe for Cranberry Caramel Apple Sauce to put on your ice cream when you run out of pie! This is a caramel dessert topping, not cranberry sauce that’s used as a condiment for the main dish. I entered my recipe for oven roasted root vegetables. I bet I’ve made it at least 300 times! I added my family’s favorite dessert…Grandma’s Pumpkin Pie. There are always a few made, and it is always asked for. There are never any leftovers. I love to make the filling for a healthy anytime snack as well. I just added a great recipe for Spiced Pecans! Fun and different for the holidays! I submitted a recipe for Zucchini Pie and found the recipe in a trusted, church cookbook local to my area which was submitted by a neighbor of my mother. I submitted Maple Glazed Sweet Potatoes. I made it for one Thanksgiving dinner, and now I’m not allowed to not make it. It replaced my grandfather’s Candied Yams recipe, which we all loved. My kitchen is Yellow & Red. Spiced Maple-Glazed Pecans, always have to make extra, somehow these disappear quickly! From Scratch Green Bean Casserole is the recipe I submitted. I found it online a few years ago on a very nice person’s blog. I wish I still had the link to it, but I don’t, and I can’t remember whose blog it was. I submitted Cranberry Salad. My kids seem to think it isn’t Thanksgiving without it. Autumn Spiced Pumpkin Pie. Yum! I submitted my Sweet Potato Casserole recipe. It always gets lot of compliments and I always have people asking me to make it again. Just submitted a great macaroon recipe. That red mixing bowl would be perfect for my daughter-soon to be bride! It would be fun to make the cake batter in my new bowl! Submitted my dad’s favorite, Liptauer Cheese Spread, in hopes of a L/C red batter bowl. I added Strawberry Walnut Salad with Poppy Seed Dressing. I just submitted my first recipe to the Farm Bell Blog! I am sharing Aunt Gene’s recipe for cranberry salad. I have made it every year for the last 40 years for Thanksgiving. 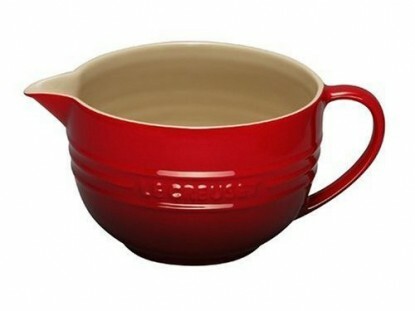 I could use new kitchen equipment after 40 years of cooking and baking–like Le Creuset cherry batter bowl. I submitted a long standing holiday favorite that my Mom made, cola salad. The batter bowl is so pretty. Thanks for opportunity to win it. I just submitted my recipe for Cranberry – Raisin Pie, I’ve been making it for years, it is delicious! I’d love to win the batter bowl, it’s so pretty! I’d love to win the batter bowl. Thanks for the chance. I left a recipe for something different. Mini onion kugles. Believe it or not, not everyone loves potatoes and these are easy to prep ahead and pop into the oven. My mother’s Cranberry Jello Salad recipe has been submitted. I was so busy cooking all the CITR recipes I never stopped to enter until now. This is the thought that woke me up this morning! I have to say, of course, that winning the bowl would be exciting, but more importantly, this has been a Thanksgiving to remember, as my daughter has developed a new interest in cooking. She has always been a good baker, but has never stopped to consider what is behind cooked dishes. With her first semester of being away at college almost behind her, and her desire to eat something besides (homemade) Hamburger Helper, Spaghetti, or Mac and Cheese growing stronger, she tackled making some of the recipes I had selected all by herself. She is VERY proud to be serving up the Make Ahead Mashed Potatoes, Mom’s Green Bean Casserole and Suzanne’s Scalloped corn later today! Just added the Guittard Chocolate Chip cookie recipe. It is a special occasion thing around here, and a pan of it just came out of the oven. Hadn’t planned to post it because my recipe is on a well worn old card, and I am just too lazy to do all that writing. But, Guittard has the recipe on their site, so it is now posted. Hurray!! Pics will be posted later. After it cools and is cut. And finally got around to adding the Green Tomato Relish that has instantly become a hit around here. It is yummy, almost like a chutney, sort of, but an excellent addition to salads, sandwiches etc. Just sent a great recipe for boiled frosting-perfect for an angel food cake. Trusted recipe from Grandma’s church cookbook.